Try This Quick and Easy Potato Salad for Your Next Summer Party! Happy Monday! We had such a busy weekend celebrating my daughter’s birthday. It always seems like a whirlwind when you’re the host of an event, ya know? So much planning and prep, making sure your guests have everything they need and are having fun, and then before you know it the party’s over and it’s back to business as usual. My husband and I love throwing parties and get-togethers. We always try to simplify and streamline the process. For example, pizza and cake. How easy would that have been for a kid’s birthday party? Since we’re part of the CSA again this summer I thought I’d cut up some fruits and vegetables and leave it at that. But then one thing led to another and pretty soon we were making everything from scratch. Our simple menu of pizza and cake was out the window. One of the things I really wanted to make was potato salad. I had never made potato salad before and had a bit of a panicked moment when I realized I had no idea what I was doing. 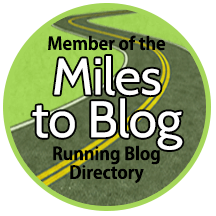 I enlisted the help from fellow bloggers and even a foodie network group I’m in on Facebook. There were so many amazing recipes posted and honestly, if I had all the ingredients listed for at least one of them, I would have just made a recipe as-is. That was the goal when I asked for recipes to begin with. Unfortunately I was missing one or two ingredients from almost every recipe posted. D’oh! So I did what any foodie would do and I made up my own. A lot of taste-testing went into this recipe and in the end I think I would have added a little more salt (which I’ve noted in the recipe below) and cooked the potatoes a little longer, but overall it turned out really, really well. It was super quick and easy to make, but none of the flavor was compromised at all. I was super proud of myself for coming up with this dish on my own! If you ever find yourself in a pinch and want to make a quick and easy potato salad — here it is! Enjoy! Scrub potatoes. Place in a large saucepan and cover with water by 1-2 inches so all potatoes are submerged. Boil water and cook for 20-25 minutes until potatoes are fork-tender. Remove from heat and place in an ice bath. Meanwhile, combine mayo, yogurt, and mustard in a small bowl. Set aside. When potatoes are cool enough to handle, remove from ice bath and pinch the skin to remove it from the potato. If you like some texture in your potato salad, leave a little bit of the skin on. Cut the potatoes into bite-sized pieces and place in a large bowl. Pour the mayo mixture on top of the potatoes. Stir in the scallions then add the salt, parsley, pepper, and dill. Stir gently to combine. Cover and refrigerate at least 30 minutes before serving. Garnish with additional salt, pepper, and parsley before serving if it needs it. I hope you enjoy this easy potato salad as much as we all did. Our guests loved it, we loved it, and I can’t wait for more potatoes from the farm share so I can make this again. It was a hit for our party and I’m sure it will be for yours, too! Have you ever made potato salad from scratch? What’s your favorite easy summer recipe to make for parties and picnics? Linking up for Meatless Mondays with Annmarie and Deborah! I agree, mustard is a must. What’s a potato salad without it?! I’ve never make potato salad. My husband and kids won’t eat it……. My grandma made the best and my mom makes a decent one. Potato salad is perfect for summer! Aw, that’s such a bummer they won’t eat it! I agree, it’s perfect for summer. Mmmm potatoes. My grandma used to make a bomb potato salad when I was a kid. This looks just as yummy! My grandmothers didn’t make potato salad that I can remember. But they passed when I was pretty young so I probably wouldn’t remember anyway. Lol. 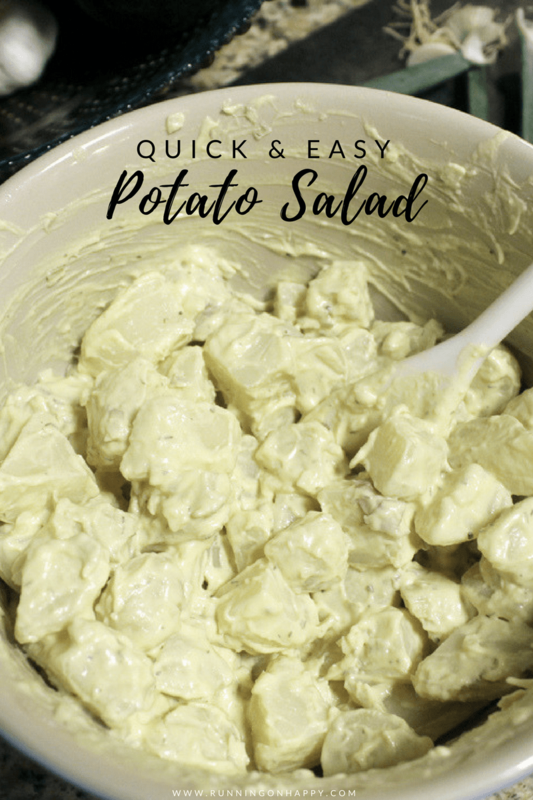 You can never go wrong with potato salad and the easier the better! Sounds like you had all the basic ingredients covered! Great summer dish! I’m always a fan of easy/quick recipes! 😛 This sounds + looks awesome! 😀 I need to go restock on Greek yogurt! We’re always stocked on Greek yogurt. It goes in everything around here. 🙂 Yum! I like to undersalt things — it’s super easy to add more, but hard to take it out (and I have several family members with high blood pressure). I totally agree with that — I undersalt things for that exact reason. If I’m going to someone’s house I bring dessert or wine. But if I’m hosting I usually make all the main stuff. My husband’s family has potato salad at every major meal! It’s always homemade. 🙂 This looks amazing and I love the addition of dill. Dill does so much for a recipe! Yum! That would be such fun to always have a homemade potato salad! I find the white potato salads too creamy. Maybe I just don’t like mayo and they need more sour cream instead. But you’re right, it’s a totally different flavor. mmm!! This sounds delicious!! We add raw onions to our potato salad, because we love onions and the crunch! I was torn between onions and the scallions. I had a ton of scallions from the farm share, though, so ultimately they won out! I love potato salad and I ALWAYS make it from scratch. I think I have never bought it from the store! Your dressing is similar to how I do mine, I use mayo, greek yogurt, pepper and salt and then add some paprika to it and (I don’t know if it’s a German thing), I like sliced cornichons/pickles in mine (does give the whole thing a bit of a tangy note!). We also sometimes garnish with boiled eggs! 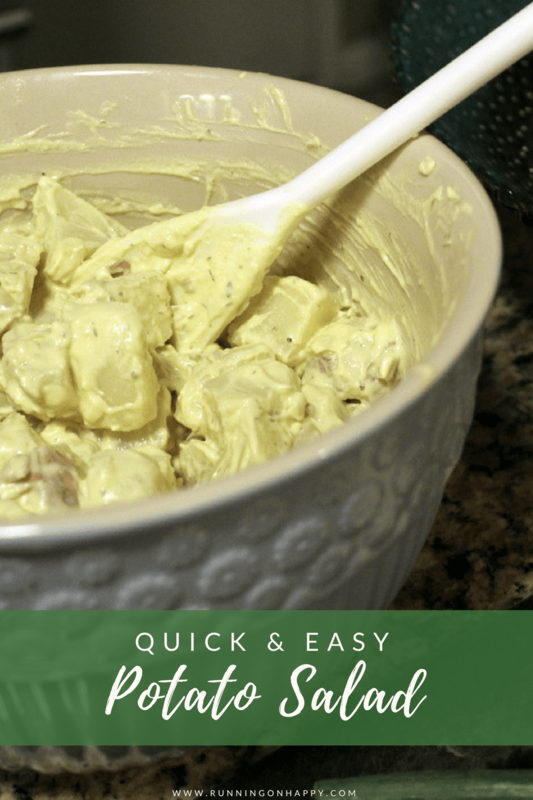 I love potato salad, especially when there is mustard involved! My mom’s sister always made the best homemade potato salad. One of these days I’m going to have to snag her original recipe. Thanks for sharing! 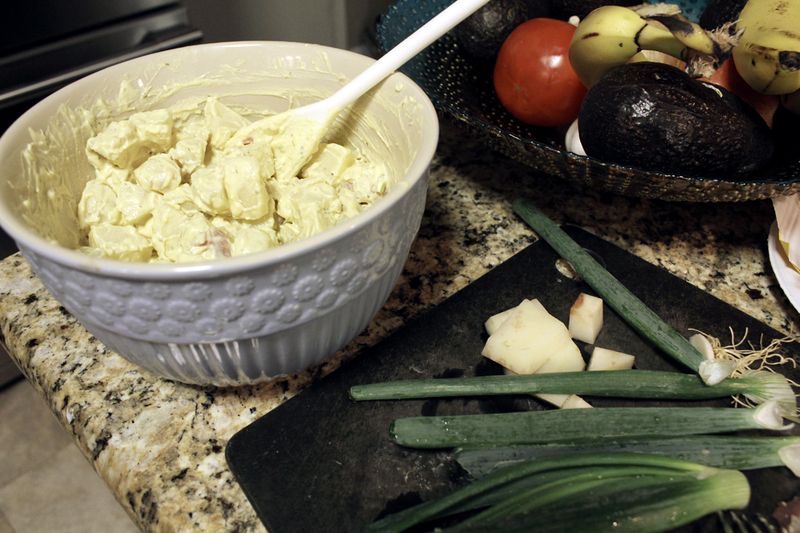 I love a good potato salad, but rarely go through the process of making it! I like to bring my black bean dish with a lime/cumin dressing. So refreshing — I’ll have to make it soon! AWESOME stuff! I love easy recipes that I often get a hankerin’ for (but am too lazy to make, lol). YAY! I will only eat homemade potato salad. The store bought kind tastes weird to me! I love potato salads and this recipe is so palatable! I will definitely prepare it soon! There is such a huge taste difference between homemade and store bought potato salad. I much prefer homemade.